After a late night on Saturday, I was not up bright and early. I pushed off about 11:30 a.m. on a 80 degree day. It was a little humid with a slight breeze along the Hudson River. My goal was the New York Botanical Garden in the Bronx. Google Maps gave me a very direct route that would take 1 hour 16 minutes on a 12 mile route up 8th Avenue and along the west side of Central Park. My friend recommended using the Hudson River Parkway instead. 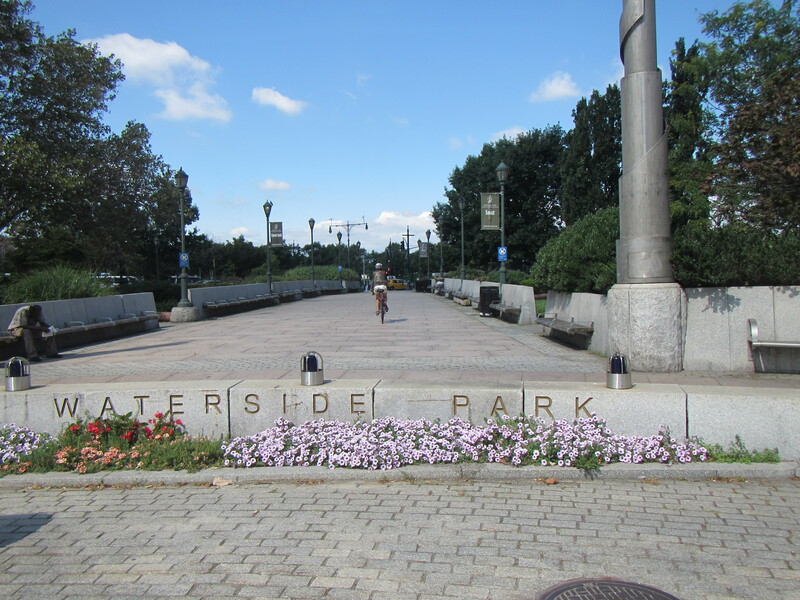 So I pedaled North along the river until the far end of Riverside Park at 125th Street. The greenway was packed with cyclists, roller bladers, walkers with and without strollers. The cyclists ride like New Yorkers drive; that is, they abide by the rules of the road occasionally. It kept me on my toes and my thumb on Black Beauty’s bell. Take a bite of the big apple on your bike. I stopped along the way and bought a Aquafina and Diet Pepsi from a vending machine and enjoyed the view. 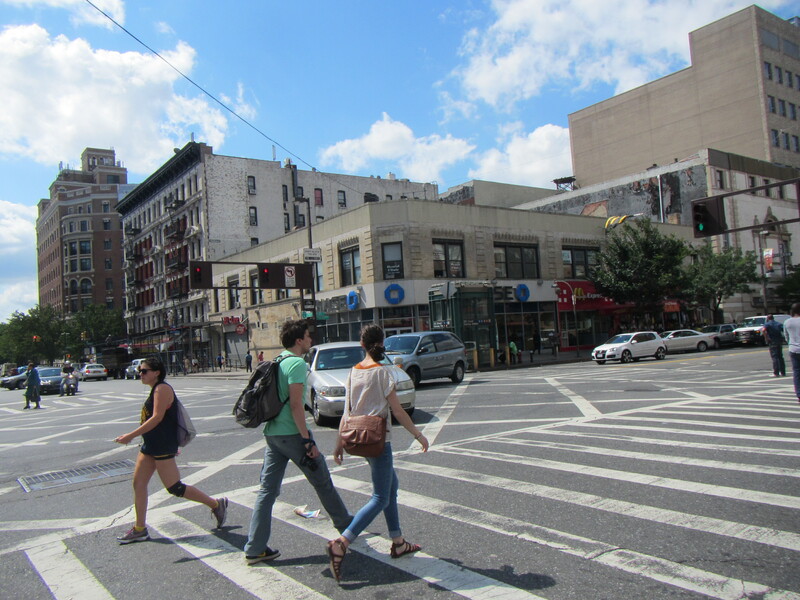 There are only a few opportunities to cross the westside highway to get back into Manhattan. 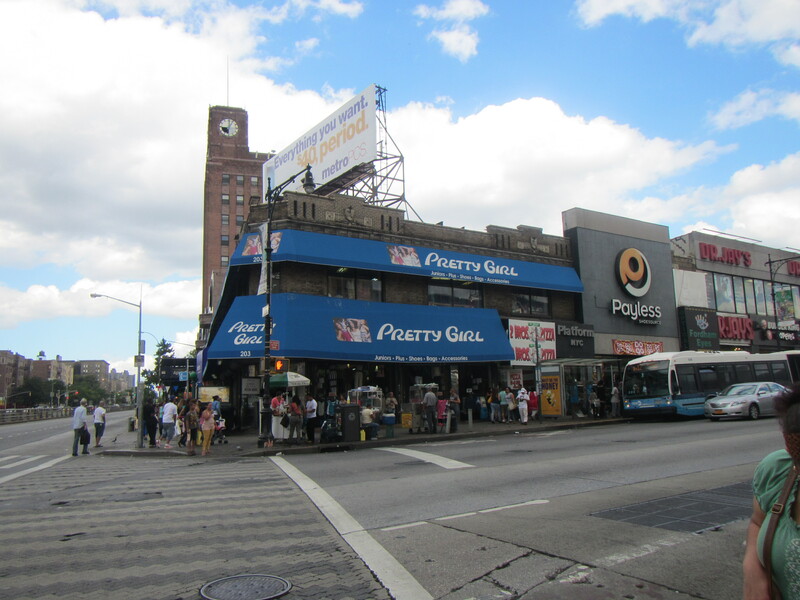 I crossed under the highway at 125th Street and found myself in Harlem. As to safety in NYC, it was broad daylight and I never felt truly unsafe. 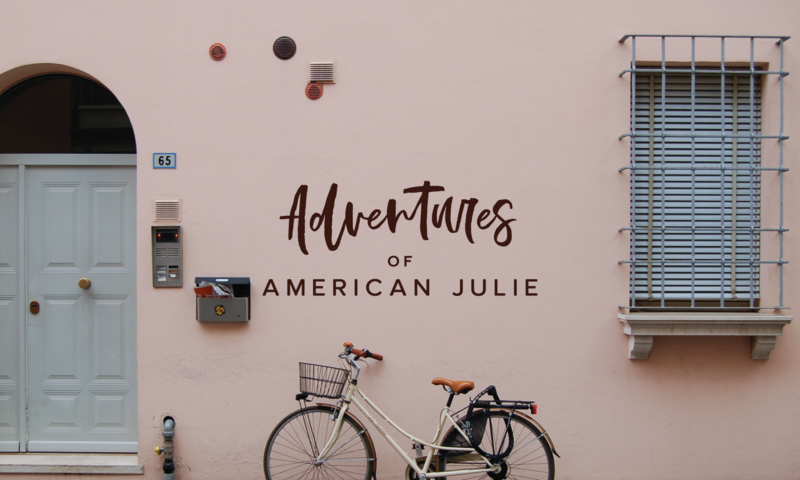 Riding in a very urban environment is a challenge for me as I ride mostly in Davis, California and environs. This is like training for a mountain ride at sea level on the flat. I was worried about getting lost because I was using my phone and Google Maps app and in the sunshine it was a challenge to read. I read the book BikeNYC for advice and I was most worried about getting “doored”. There is also a lot of different paving and a plethora of manhole covers and other kinds of metal covers on the street. My original plan was to borrow my friend’s lock, but this went awry because he does not ever leave his bike away from home. So I knew that wherever I went I’d need to fold my bike and push it rather than leave it locked. My Brompton bike attracts attention and at one point two guys in a tricked out Mercedes followed me slowly. It crossed my mind that someone might steal my bike out from under me, so I practiced defensive riding. I spotted a guy taking photos ahead on the sidewalk. I stopped by him, got off and walked in a new direction on the sidewalk for a block. It was enough to shake them. Let’s face it, New York City is a far cry from the scary legends I heard when I was growing up. The real challenge was finding my way across the Macombs Dam Bridge. By the time I crossed the bridge and entered the Bronx I had been riding Black Beauty for almost 2 hours with only short breaks. I was wearing jeans, not bike shorts, so it is official: my Brooks bike seat is fantastically comfortable. 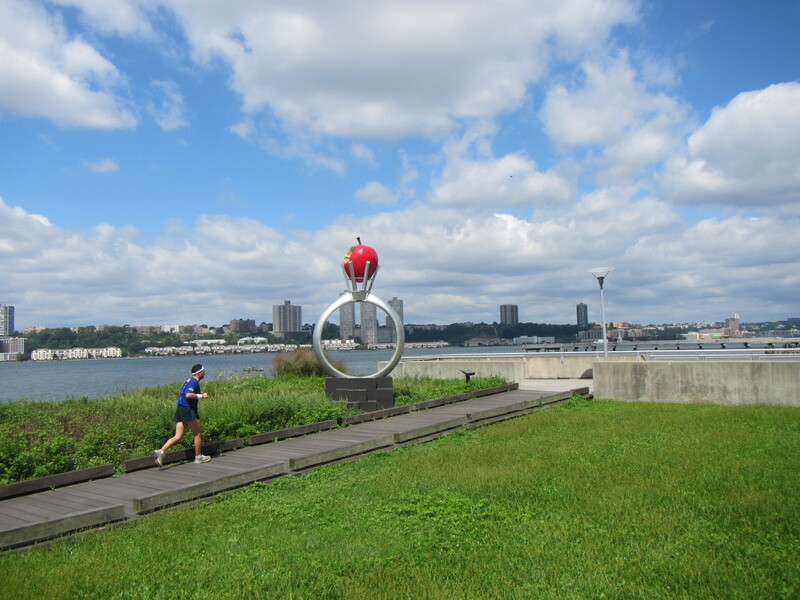 Turn right on Hudson River Greenway, ride 9 miles. Turn right on 125th Street. and so on. Good lesson for the next ride. The new Yankee Stadium at game time. Crossing the bridge was far from intuitive, so I asked the policewoman who was directing traffic how to cross on a bicycle and she did not know. A lot of people bicycle in New York but I guess it still is a novelty to some. 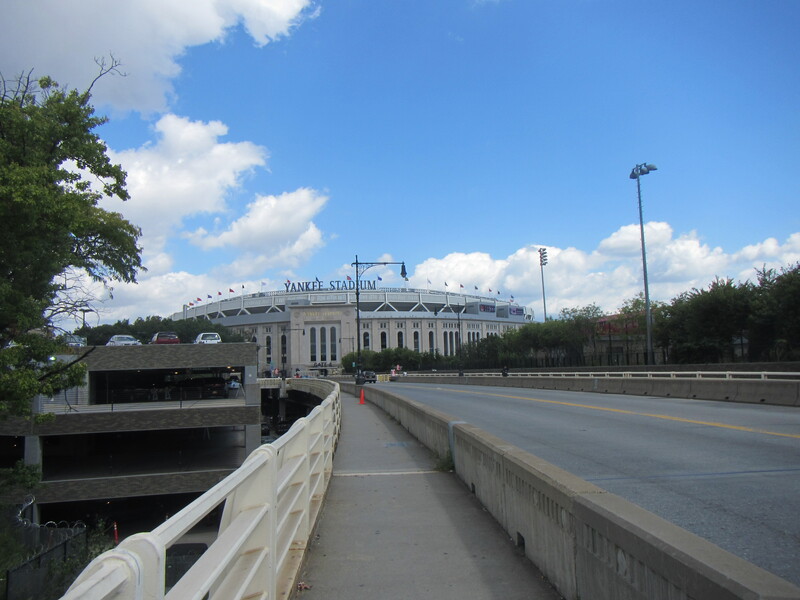 I was rewarded with a great view of Yankee Stadium once I crossed the bridge. A game had just started and people were still pouring into the stadium. I love visiting ballparks and I was tempted to stop and try to buy a ticket. As a Giants fan and secondarily as a Red Sox fan I felt slightly guilty. Plus I have been trying to get to the New York Botanical Garden for years. I checked Google maps and pedaled on. Again, the reputation of the Bronx is much worse than current reality. My main beef was with all of the drivers who viewed the beautiful bike lane as “reserved parking” and twice I had to brake hard as a cab darted in just in front of me to drop off a fare. I was getting closer to the Garden and my mental focus was wearing down. 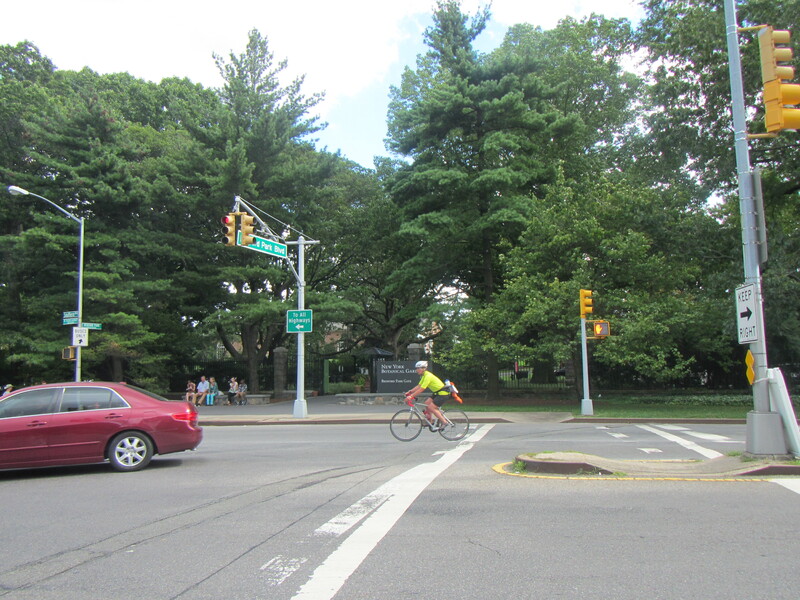 Google Maps had me ride to Bedford Park Boulevard and enter the NY Botanical Garden from the Bedford Park Gate. The New York Botanical Garden website encourages you to ride your bike and provides some guidance on how to arrive. It does say that you can not ride your bike in the grounds; however, I thought if I folded up my bike I could push it around like a stroller. I should have probably folded it up before approaching the ticket booth. The staff would not let me take my bike in and suggested I leave it in the parking garage a half block away. I rode to the parking garage and discovered that instead of bike lockers there is just a classic s-shape bike rack. I was close to tears now as I was so close to the Garden but could not get inside. I saw an official looking man driving a golf cart and I asked him if there was any other bike parking. My lucky day: it was Mark, the head of NYBG security. He listened as I told him my tale of woe and he came to my rescue. He asked me to fold up my bike and put it on his cart. He whisked me over to the Moshulu Gate and locked my bike in his security hut and assured me that the nearby security guard would help me retrieve it when I was ready to leave. What a stand up guy! My day went from catastrophe to brilliant. With some parting advice from him on the best things to see, I started my garden adventure. Pointer: Bring a bike lock! And there is a more visible bike rack at the Moshulu Gate right by the security guard station. I rode the train to Grand Central Station and cabbed it to my friend’s house to make it back in time for dinner plans. My Black Beauty is easy to take on train, and folded she fits easily in the cab’s trunk. It felt great to reach my goal of riding from Chelsea to the NYBG, although I wish I started earlier so I had most of the day at the Garden. And the next day when I went to the Bicycle Habitat shop in Chelsea the staff person said that the way I rode was probably 20 miles!